The Hawaiian Bobtail Squid is a very small squid (only about an inch long as adults), and because squid do not have shells like most other mollusks, it is vulnerable to predation. 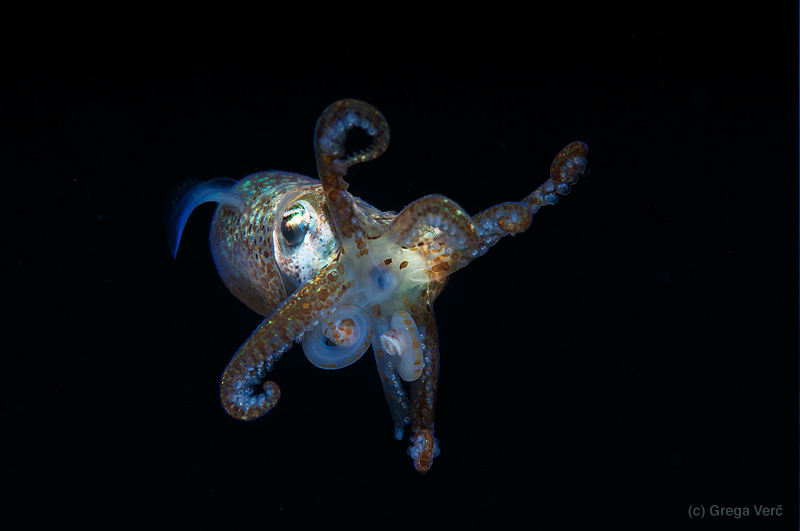 Most cephalopods have some form of adaptive camouflage, allowing them to match the texture and intensity of the substrate, but the Hawaiian Bobtail Squid takes this a step further. They have a symbiosis with bioluminescent bacteria (Vibrio fischeri) that live in their light organ on the bottom of their body. Why would they want them on the bottom? These bacteria produce blue light, which closely matches the appearance of moonlit water when viewed from below. This type of camouflage is called countershading and allows this squid to be almost invisible to predators below when it is swimming near the surface of the water.